"It is very frightening and many people are simply panicking," says Ghebrihiwet Tekle. He comes from Eritrea, has applied for asylum in Israel and is now volunteering in the office of the Hotline for Refugees and Migrants, an Israeli NGO based in Tel Aviv. The 37-year-old works here as a Tigrinya translator, a language spoken in Ethiopia and Eritrea. The mood is gloomy: A few days earlier, the Israeli immigration and border authorities launched a controversial campaign. The aim is to either get Eritrean and Sudanese asylum seekers to go to a third country or to imprison them indefinitely. Those affected have to make a choice. They have until the end of March. At a cabinet meeting at the beginning of January, Israeli Prime Minister Benjamin Netanyahu praised the plan. "Intruders have a simple choice," said Netanyahu. "Either they cooperate with us and leave the country voluntarily, respectfully, humanely and legally, or we must use other means at our disposal." Although the plan has already been heavily criticized by human rights groups, Netanyahu wants to go one step further, according to a report in the Haaretz newspaper. Consequently, the possibility of forced deportation is to be examined in the light of overcrowded prisons and the high cost of providing accommodation. Meanwhile, however, the plan to implement forced deportations has been described by Israeli officials as "unrealistic." 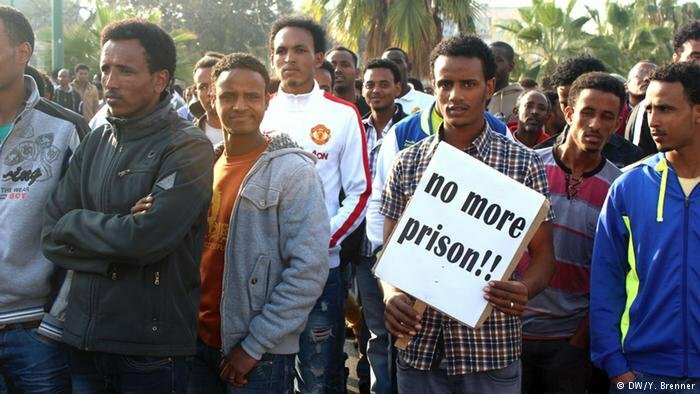 Now that the clock is ticking, most people in the Eritrean and Sudanese communities in Israel feel extremely vulnerable, says asylum seeker Tekle. He knows their stories and problems only too well from his own experience. "They say that certain groups will be exempted from having to leave the country. But who knows? When they're done with one group, maybe they'll come to us. There is no security." 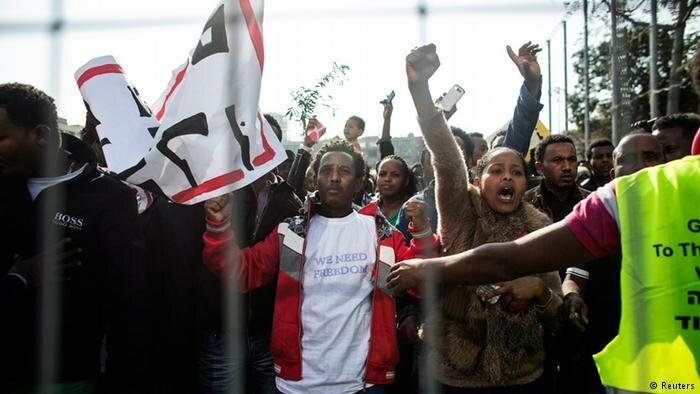 An estimated 37,000 Eritreans and Sudanese live in Israel. They immigrated between 2006 and 2012 before the country built a high-tech security barrier to close the refugee route across the Egyptian Sinai Peninsula. To date, the vast majority of African migrants have not been granted refugee status. According to the UNHCR, only eight Eritreans and two Sudanese nationals have been recognized as refugees in Israel. All others have been given a temporary residence permit, which must be renewed every three months. Those who have not applied for asylum will now be encouraged to accept a free air ticket and $3500 (€2909) for their departure at the next renewal of their residence permit. If they refuse, they face the threat of going to jail. Those imprisoned in the Holot detention facility in southern Israel are also being put under pressure to leave the country. According to reports, a large number of exceptions have been made for the time being: Families, children, people over 60, victims of trafficking and those applying for refugee status should not be affected. "Recognition of asylum in Israel is currently at less than one percent. In Europe, the average recognition rate for Eritreans is about 90 percent," says Tamara Newman of the "Hotline for Refugees and Migrants." When Sudanese and Eritreans came into the country, they received "group protection," Newman explains. But they were also told not to apply for asylum, she says. According to Newman, even the submission of individual asylum applications proved difficult last year. "There's only one office in the country where people can make their applications." People would queue up in the evening to be admitted at 7 a.m. the next morning. "And they let a hundred people in every day," says Newman. Ghebrihewet Tekle submitted his application three years ago and is still hoping for refugee status. 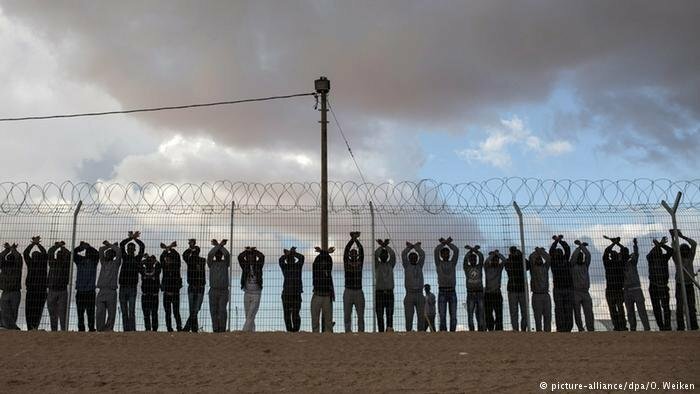 The soft-spoken man fled Eritrea after being arrested for taking part in protests when he was a student, and was later forced to serve in the army for three years – for a country that, according to international human rights groups, is responsible for serious human rights violations. "I saw myself without a future there, so I decided to take the risk of leaving my country," says Ghebrihiwet Tekle. First, he fled to Ethiopia, where he lived in a refugee camp for a year. He continued on to Sudan and later had to pay human traffickers to cross the Sinai, finally reaching Israel in 2007. In Israel, the army took care of him in the first days. Some of the newcomers were sent to prison, others were given a bus ticket to Tel Aviv, where many settled in the capital's poorer districts. This has led to long-lasting tensions with local residents. Instead of being regarded as refugees, Africans are usually referred to as "intruders" and "economic migrants." Their presence in Israel has been the subject of an often heated and sometimes populist debate for years. Tekle says he is grateful and happy to have reached the safety of Israel. But now it is uncertain what will happen in the near future. Israeli human rights organizations are outraged about the plan and have warned of potential risks. Cases of people who have already left Israel for third countries under the so-called "voluntary exit program" have shown that some face violence and extortion on arrival. And some of the returnees have become refugees again, trying to cross the Mediterranean from Libya. Voluntary departure is not an option for Ghebrihiwet Tekle. "I would prefer to go to jail until my country is safe again." Rwanda or Uganda are not an option for him, he says. "I don't feel safe there."